The main component of cheese is cheese. Of course, it would be wiser to call them with the curd, as is done in some cookbooks. The fact is that until the nineteenth century cheese in Russia called cheese, the definition of "cheese" appeared much later, and cheesecakes remained "cheesecakes"
Take for cooking cheesecakes is a good cheese high fat content. If the cheese is too wet, drain it through cheesecloth for several hours. It should also wipe it through a sieve, it will give the finished product more airy. Mix in a bowl the egg with sugar and salt, add curd and mix well. Sprinkle the mass with flour and form the dough into a thick flat roll. Divide it into 8 equal parts, shape each piece of dough oblong or round cheesecake. Preheat a frying pan vegetable or melted butter, roll in cheese breadcrumbs flour or semolina, place them in boiling oil. Slightly turn down the heat and cook the cheesecake until Golden brown, then it should turn over to other side and fry the same way. If the cheesecakes badly cooked through, bring to readiness they can and the lid, the worse they become. 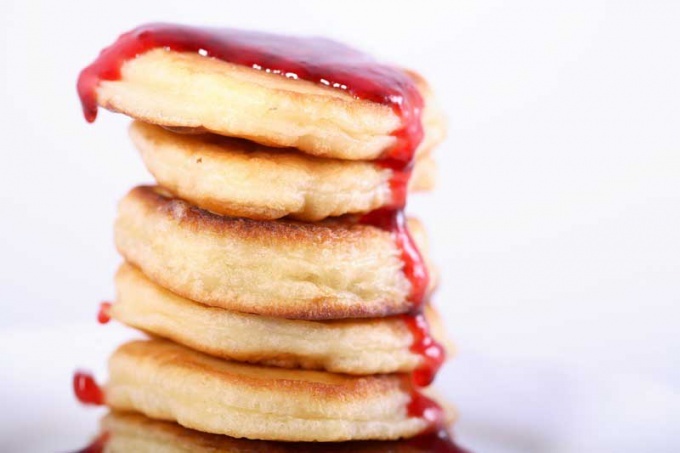 Serve pancakes with sour cream, jam, vanilla sauce. In General, your habits and likes. You can even make them savory by replacing the sugar in the recipe for chopped herbs or sun-dried tomatoes. The recipe can be varied endlessly. Most importantly, to prevent spreading of the test. To make the dough liquid can eggs, moisture in the cottage cheese, the excess amount of sugar and other ingredients. To thicken the mass have to use more flour, which would add to the pancakes and will make them dense and tasteless. If the breading to take semolina, ready-made cheesecakes will have a browned crispy crust.